Are you looking for a team to help you build a great App for your company? We can handle mobile projects from small, simple Apps to complex projects. Millions of users rely on our platforms for clients including USC, CAL Berkeley, BNP Paribas Open, Out of Africa Theme Park, Joe’s Italian Ice, Hope Family Wines and the Rogers Cup. Our Apps have risen to # 1 in Education, #2 in News, #3 in Entertainment & #5 in the Sports & Lifestyles categories. Many of our customers are looking for us to take their unique ideas and make them a reality or have a specific business need and are looking for us to solve that need by creating a custom App or web-based solution. Our team will work with you and handle all aspects of the process from design, to development and testing, through project launch and marketing. We have a number of platforms that have been built, tested and implemented in the market. Millions of customers use our Apps each day and perhaps your needs are a fit for one of our platforms. Our platforms are true custom Apps but since they are already developed the price is often much less than a custom App and the implementation could be a fraction of the time. ▸ What does an App cost? Just like the cost of building a house, there are a plethora of factors that go into the cost of building an App. We also need to understand your App idea and goals in order to accurately price our services to build and optionally help you market the App. We will need to know: - What is your estimated budget? - Who is the audience for your App? - What features will the App have? - Are there similar Apps that attempt to satisfy similar objectives of your target audience? - Which platforms are you looking to develop your App for (iPhone, iPad, Android, etc.)? - Does your app need to work with other services? For example, does it pull data from web sources, does it need to work with a website, is there a commerce/merchant account component, etc. - Have you created any materials such as a business plan, written summary of your App, flowcharts, artwork/logos, mockups of screenshots, etc.? At this early stage of discussions we do not suggest you send us these pieces of information, but we would like to understand how far along you are in the conception and design of your App. - How many people do you believe will be using the app initially, after the first 6 months, after the first year, etc. These are just a few questions that need answers before determining the cost of an App. The APP Company offers Apps that start as low as $1,000-5,000 using proprietary technologies we have built and can repurpose for your brand and then we have custom Apps that will cost anywhere from $20,000 to over $100,000 that involve several months or years worth of custom programming and features. In our experience, any good custom App will cost a minimum of $30,000, but perhaps your App can be developed on one of our existing platforms, and if so, the cost can be considerably cheaper and the time to market will be greatly reduced. We find it helpful if you can point to one or more apps that are available on the App/Play stores and explain to us how your app will be similar to these. For example, you might say: "My app will be similar to Facebook, but focus on the farming community and will include resources and content sharing important to farmers." You can also say, my app is a cross between "product X" and "product Y". It's also helpful for us to price an app and give you a development timeline if you can supply us with sketches, mockups or wireframes. A great online service for producing these is http://moqups.com. ▸ How long does an App take to develop? Just like knowing the cost of an app's development is depedent upon many factors, so does the timeline. The same questions need answered to determine what all is involved in turning your concept into a reality. Basic projects can be completed in as short as 1-2 weeks while more complex projects can take a couple months to over a year. Understanding exactly what you are looking for and having examples or sketches to reference, make the process of providing a price and timeline much easier and makes the entire process more efficient. ▸ How do I make money with an App? When it comes to monetizing an app, there are a variety of methods. - Charging users to download the app - In-app purchases (features, bonuses, incentives inside of the app) - Advertising - Subscription-based access - Service-based business - Selling of products or services Deciding the best ways to monetize an app depends on the app itself. For example, if you are creating a game, the most popular choice of monetization is allowing users to download the app for free, but offer boosts in the game as in-app purchases. If you are creating a content-based app, you may charge users a monthly subsctipion to access premium content and/or include advertising inside of the app. Many developers choose the "freemium" model where they offer the app for free and then charge for premium features in the app. Another "freemium" strategy is to offer all features for free, but some or all of the features are only available for a limited time. ▸ How do I turn my App idea into reality? Turning an idea into reality requires a strong team that understands how to take the idea and evolve it into a full fledged app with a business model behind it. The APP Company has launched over 100 apps for many of the top organizations, brands, and personalities including the University of Southern California, the BNP Paribas Open, Buzz Aldrin, Ron Artest, and many more. Most of our clients started with a plan on what they were wanting to achieve and have built and we have taken their original concept and grew it into a successful product launch. In order to work with the right team, you must have an idea of your budget for the project. While you don't have to have an exact number in mind, understanding your budget allows us to come up with the best possible gameplan for you and your idea and do so while staying within your budget. If you don't have a budget, your focus should be on conceptualizing your idea as much as possible and acquiring backers or loans to fund your project. Keep in mind, the development and design of the app is half the process, you must have a budget for marketing your app as well so that your app gets into the hands of users. – What is your estimated budget? – Who is the audience for your App? – What features will the App have? – Are there similar Apps that attempt to satisfy similar objectives of your target audience? – Which platforms are you looking to develop your App for (iPhone, iPad, Android, etc.)? – Does your app need to work with other services? For example, does it pull data from web sources, does it need to work with a website, is there a commerce/merchant account component, etc. – Have you created any materials such as a business plan, written summary of your App, flowcharts, artwork/logos, mockups of screenshots, etc.? At this early stage of discussions we do not suggest you send us these pieces of information, but we would like to understand how far along you are in the conception and design of your App. – How many people do you believe will be using the app initially, after the first 6 months, after the first year, etc. These are just a few questions that need answers before determining the cost of an App. The APP Company offers Apps that start as low as $1,000-5,000 using proprietary technologies we have built and can repurpose for your brand and then we have custom Apps that will cost anywhere from $20,000 to over $100,000 that involve several months or years worth of custom programming and features. In our experience, any good custom App will cost a minimum of $30,000, but perhaps your App can be developed on one of our existing platforms, and if so, the cost can be considerably cheaper and the time to market will be greatly reduced. We find it helpful if you can point to one or more apps that are available on the App/Play stores and explain to us how your app will be similar to these. For example, you might say: “My app will be similar to Facebook, but focus on the farming community and will include resources and content sharing important to farmers.” You can also say, my app is a cross between “product X” and “product Y”. It’s also helpful for us to price an app and give you a development timeline if you can supply us with sketches, mockups or wireframes. A great online service for producing these is http://moqups.com. How long does an App take to develop? Just like knowing the cost of an app’s development is depedent upon many factors, so does the timeline. The same questions need answered to determine what all is involved in turning your concept into a reality. Basic projects can be completed in as short as 1-2 weeks while more complex projects can take a couple months to over a year. Understanding exactly what you are looking for and having examples or sketches to reference, make the process of providing a price and timeline much easier and makes the entire process more efficient. How do I make money with an App? When it comes to monetizing an app, there are a variety of methods. Deciding the best ways to monetize an app depends on the app itself. For example, if you are creating a game, the most popular choice of monetization is allowing users to download the app for free, but offer boosts in the game as in-app purchases. If you are creating a content-based app, you may charge users a monthly subsctipion to access premium content and/or include advertising inside of the app. Many developers choose the “freemium” model where they offer the app for free and then charge for premium features in the app. Another “freemium” strategy is to offer all features for free, but some or all of the features are only available for a limited time. How do I turn my App idea into reality? Turning an idea into reality requires a strong team that understands how to take the idea and evolve it into a full fledged app with a business model behind it. 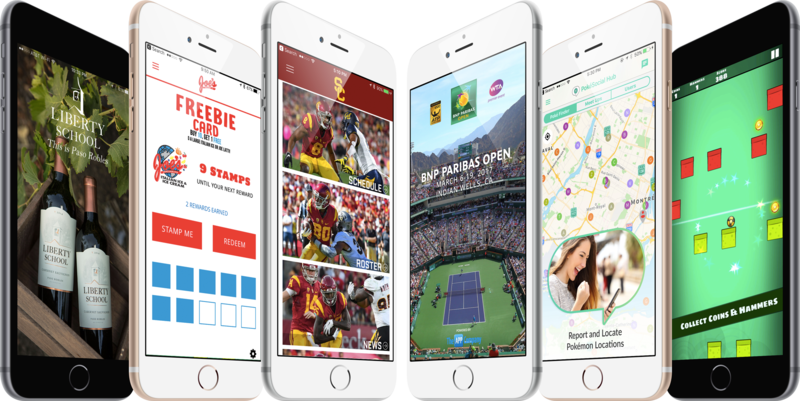 The APP Company has launched over 100 apps for many of the top organizations, brands, and personalities including the University of Southern California, the BNP Paribas Open, Buzz Aldrin, Ron Artest, and many more. Most of our clients started with a plan on what they were wanting to achieve and have built and we have taken their original concept and grew it into a successful product launch. In order to work with the right team, you must have an idea of your budget for the project. While you don’t have to have an exact number in mind, understanding your budget allows us to come up with the best possible gameplan for you and your idea and do so while staying within your budget. If you don’t have a budget, your focus should be on conceptualizing your idea as much as possible and acquiring backers or loans to fund your project. Keep in mind, the development and design of the app is half the process, you must have a budget for marketing your app as well so that your app gets into the hands of users. Will we sign an NDA? We receive hundreds of inquiries each week. Most people submitting ideas to us believe that their idea is completely new and unique. The reality is that most ideas are not new and are either very similar to exisitng apps in the marketplace or are slight variations of existing ideas. We cannot sign an NDA prior to engaging with you, but we do appreciate your situation and concerns. We have been successful in this industry because of many factors, but we are most proud of our integrity and reputation with partners, media and customers. If you are concerned that your idea is completely unique and must be protected, then we would suggest that you not disclose the full idea to us up front. You can tell us the audience for your App, give us names of Apps in the marketplace that are attempting to address a similar need, and relate aspects of the idea that are not completely unique to your App. Once we establish a relationship and decide it is mutually beneficial for our teams to move further down the road together, we will be open to signing an NDA. So in summary, it is our policy not to sign an NDA upon initial inquiry before we determine if there is a fit between our two teams, but once we have established a relationship and desire to explore working together, sure we would be open to signing an NDA. Let us work with you to bring your app to the masses and scale at an alarmingly fast rate. What is the App creation process? If you’re looking to build an App, partner with us on a business opportunity, need help with marketing your product or like to engage with us for a consulting assignment, we would love to hear from you. Please take a moment to read the FAQs above. The answers to many of the common questions we receive each day are contained in these FAQs. We are known for our custom Apps for small, medium and large companies with budgets from tens to hundreds of thousands of dollars. We also have several turn-key platforms that are packed with features and have gorgeous interfaces, yet can cost a fraction of the cost of custom Apps. Please give us as much details as possible about your needs and let us know your planned budget.